Fats Domino’s impact upon Rock and Roll music cannot be overstated. For over 50 years, his songs have been mainstays of the genre, garnering hits not only for himself, but for a plethora of well-known musicians- from Pat Boone to Ricky Nelson, to Cheap Trick. Beatle John Lennon always credited Domino’s “Ain’t That A Shame” as the first song he ever learned to play on guitar. The first rock and roll song that Beatle George Harrison ever heard was Fats’ “I’m In Love Again.” Paul McCartney regularly did impressions of Fats and “I’m Walkin’” in the early days of the Beatles. 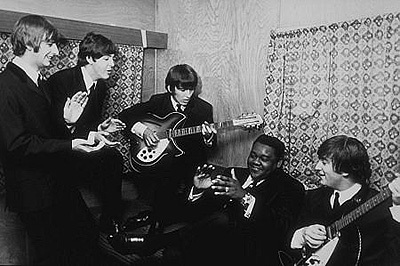 The Beatles freely admitted that their song “Birthday” from the “Double-White” album, was nothing more than a song cobbled together out of old Fats Domino riffs. McCartney’s “Oh Darlin’,” from Abbey Road is an unabashed Fats tribute. 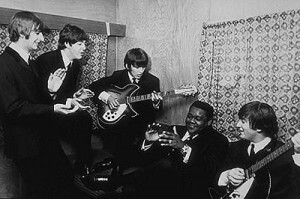 Both Lennon and McCartney recorded Fats Domino songs in their post-Beatles solo careers. 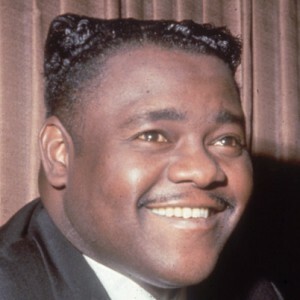 But, beyond the profound influence Fats Domino had over several generations of Rock and Roll musicians, he was extremely popular with the public as well. Except for Elvis Presley, Fats outsold every ‘50s Rock act, with over 65 million units sold through the course of the decade. Though he was not as charismatic as some of his notable counterparts- such as Presley, Little Richard, Chuck Berry or Jerry Lee Lewis, Fats Domino was far more prolific. All of those stars, and many others, recorded Domino compositions, making of him one of the most covered composers of the day. Antoine Domino was born on February 26th, 1928, into a large, musical family. They lived in a large house on a dirt road in the Lower Ninth Ward, on the outskirts of the city of New Orleans, Louisiana. Antoine’s first language was French. As a child, he loved to sing. When Antoine was seven years old, his brother-in-law Harrison Verrett, many years his elder and a local musician, taught him the rudiments of piano. Verrett also became the lad’s first manager, when it became apparent that Antoine would pursue music as a career. By the time he was 10 years old, Antoine was performing in public; playing piano for pennies in honky-tonks, such as the popular Hideaway Club on Desire Street in New Orleans. It was at The Hideaway Club that bandleader Billy Diamond nicknamed the young boy “Fats,” not only as an accurate assessment of the child’s size, but- referring to Fats Waller- also as a tribute to his abilities on the piano, as well. At age 14, Antoine quit school to work in a bedspring factory. This enabled him to continue to play piano in the bars at night. There he played alongside legends such as Amos Milburn and Professor Longhair. He also learned the Stride and Boogie Woogie piano techniques of his namesake Fats Waller, Meade Lux Lewis, Albert Ammons and especially the triplet-style approach of Little Willie Littlefield. Like Professor Longhair, Domino’s piano style was drawn from the fertile mix of musical cultures which flourished in New Orleans throughout the first half of the 20th century, including Dixieland Jazz, Latin rhythms, Cajun and Blues influences and Boogie Woogie. Fats mastered the style: easy rolling syncopated left-hand bass patterns balanced against right-hand arpeggios. He slowly developed a vocal technique that involved rich, relaxed phrasing. The shy teenager regularly opened shows for the likes Paul Gayten and Roy Brown (whose “Good Rockin’ Tonight” helped to inaugurate the Rhythm & Blues era in the mid ‘40s). Fats Domino became a fixture at the Hideaway Club, garnering critical acclaim for his easy piano style and smooth vocal delivery. In late 1949, Fats was playing his customary engagement at the Hideaway Club, when he was approached by local bandleader Dave Bartholomew and Hollywood record producer Lew Chudd. Bartholomew was a well-known New Orleans scene veteran, who had worked with all of the area’s best musicians and band leaders. Chudd owned Imperial Records. Chudd recruited Bartholomew to find and produce local R&B talent. Bartholomew recognized in Fats an unique talent, who specialized in a “jailhouse blues” style that was distinctive to the region, a style which included Domino’s characteristic piano triplets, derived from Little Willie Littlefield. Within a short time Fats and Bartholomew became songwriting collaborators, as well as musical partners. Their musical partnership would span a decade, until 1960 and would eventually yield most of Domino’s 68 Billboard Top 100 hits, including 23 million-sellers, 17 of which the two co-wrote. “The sound” to which Bartholomew referred was the seminal form of what was soon to become “Rock and Roll.” And it was with Fats Domino that Bartholomew helped to develop that sound: harder driving than Boogie Woogie or Rhythm and Blues. It was that “different beat” to which Lew Chudd referred. It was the Fats Domino sound. Domino signed a contract with Chudd and Imperial Records. And, at his first recording session, in New Orleans on December 10th 1949, he made certain that the first song he recorded, among the eight tracks they cut that day, was the traditional Cajun number, “Hey La Bas.” La Bas was the voodoo god of luck. It was traditional for any musician of French extraction from the New Orleans area to record the song as a good luck omen. For Fats, it was the culmination of many years of musical and cultural influences. But, though it was the first song recorded, “Hey La Bas” was not the first song released by Imperial. 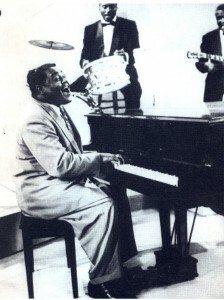 Instead, Fats and Bartholomew reworked an old New Orleans standard, called “Junker’s Blues.” The pair cleaned the song of its drug references and self-referentially re-titled it “The Fat Man.” Released in February, 1950, the song peaked at #2 on the R&B charts, eventually selling over a million copies. “The Fat Man” is often referred to as the first Rock and Roll song, although such assertions will always be the subject of great dispute. As far as Fats was concerned, he was merely playing the same sort of music he had been playing in New Orleans for years. Referring to being called the “Father of Rock and Roll,” Domino, himself, later said, “Well I wouldn’t want to say that I started it, but I don’t remember anyone else before me playing that kind of stuff.” Whatever the case, Fats Domino was suddenly a Rhythm and Blues star. “The Fat Man” was an immediate hit and helped to establish Fats’ patented sound, with a wah-wah vocal chorus over a rolling piano rhythm. By the age of 22, Fats Domino had already lived a full life. He was married to Rose Mary, his childhood sweetheart (to whom he remains married, after over 50 years). He was already a father (eventually, of eight children), as well. He had survived a near-fatal car accident, after previously almost losing a hand in a mishap at the bedspring factory. On occasions, Domino’s relaxed approach to his material was in diametric opposition to the urgent qualities exhibited in most R&B material of the day. To overcome that, Imperial recording engineers would routinely speed up Fats’ recordings, before they were released on record. Yet it was precisely that lazy style that resulted in Fats’ eventual success. 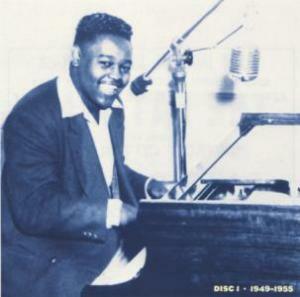 Throughout the early ‘50s, Fats Domino scored a string of R&B hits, with best-sellers such as “Rockin’ Chair,” “How Long,” “Goin’ Home,” “Goin’ To The River, ” “Please Don’t Leave Me, ” “Don’t You Know” and “Rose Mary,” songs which regularly sold between half a million and a million copies each. 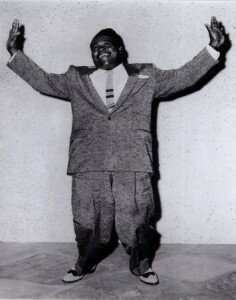 Fats had five Top 10 R&B records in 1953 alone. He also toured the country several times, developing a reputation that began to extend beyond his mostly black R&B fan base, to include a broader (mostly white) Pop audience, as well. 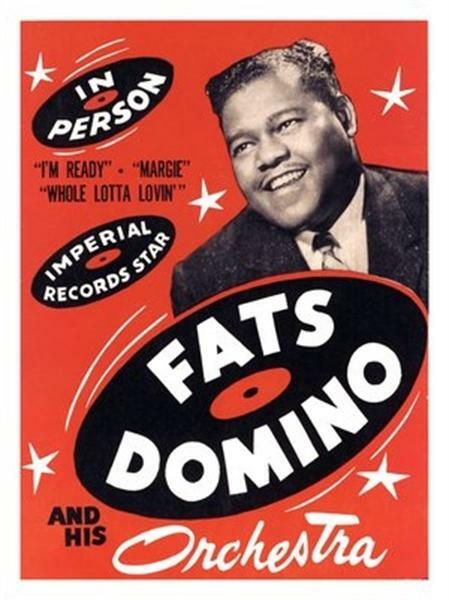 1955 was a breakthrough year for Fats Domino. The release of his song “Ain’t That A Shame” quickly reached the Top 10 of the Pop charts, while hitting #1 on the R&B charts. The song served to establish Domino’s identity for white teenagers. Fats’ easily identifiable voice- with a slightly smoky-texture and just a hint of New Orleans drawl- and his easy-going piano style, proved to be quite accessible to his newfound white fans, as well as with his traditional R&B fans, whom were already quite familiar with his music. Pat Boone, who founded his career on removing the coarser aspects (some would say the heart and soul, as well) from the songs of successful black performers, launched his career with his version of “Ain’t That A Shame,” released at the end of 1955. While Fats’ version of “Ain’t That A Shame reached #10 in the Pop charts, Pat Boone’s rendition reached #1. Still, the song managed to establish both performers as Rock and Roll stars. Domino wasted no time in capitalizing on his hit song. In 1956 he placed five songs in the Top 40, including “I’m In Love Again,” which reached #3 on the Pop charts. Propelled by Lee Allen’s memorable saxophone phrases, the song proved to be a catchy hit. The flip side of the record was also a huge hit. “My Blue Heaven” was a standard from the 1920s, a song which Harrison Verrett had sung with Papa Celestin’s New Orleans Jazz band, nearly three decades earlier. 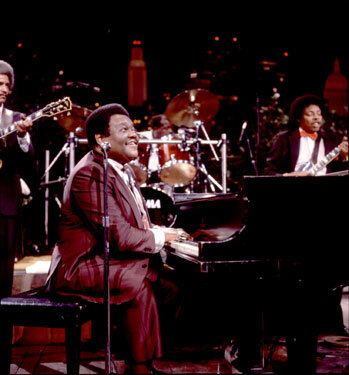 Given the signature Domino piano triplet treatment, but aimed specifically at an older audience, the song became a staple of his live act throughout the rest of his career. The hits continued throughout 1957, with the million-seller “I’m Walking,” which was also the debut hit single for Ricky Nelson (who subsequently recorded several Fats Domino songs). During one five month span between late 1956 and early 1957, Fats held the #1 spot on the R&B charts for five straight months, as well as having five Top 40 Pop hits at the same time. In addition, Domino was leading Rock and Roll caravans across the country, heading bills which included Chuck Berry, The Everly Brothers and Buddy Holly and the Crickets. Fats also appeared in what is considered to be one of the finest Rock and Roll films ever made, The Girl Can’t Help It. Several more Top 10 songs followed in the late ‘50s, including “Whole Lotta Loving,” “I’m Ready,” “I’m Gonna Be A Wheel Someday,” I Want to Walk You Home” and “Be My Guest.” The latter song, a response by the writer to his father’s suggestion that he either get a job or move out of the house, launched the songwriting career of Tommy Boyce (whom, with Bobby Hart, penned many Pop hits in the ‘60s, including a number of hits for the Monkees). Boyce waited in line with hundreds of other fans one evening, in order just to meet Domino and pass the song onto him. Fats Domino had his final hit in 1960 with “Walking To New Orleans.” Shortly after that, he ended his long musical relationship with Dave Bartholomew. Fats continued to record throughout the early ‘60s. In 1963 Lew Chudd sold Imperial Records and Fats signed a contract with ABC-Paramount. During those years he mostly recorded Country songs such as Hank Williams‘ “Jambalaya” and “You Win Again,” as well his version of the standard, “Red Sails In The Sunset.” In a 1968 comeback, he recorded a rousing version of the Beatles “Lady Madonna,” a song whose dynamic left hand piano bassline Paul McCartney attributed to Fats Domino’s influence. 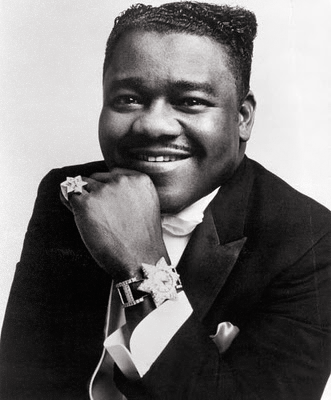 In the intervening years since that time, Fats continued to record, mostly remakes of his hits. He also continued to tour, with frequent stops in London and Europe, while often playing extended engagements in Las Vegas. In 1986 he was one of the original inductees into the Rock and Roll Hall of Fame. In addition, that same year, he received a Grammy Lifetime Achievement Award. In 1998, President Bill Clinton awarded Fats the prestigious National Medal of Arts. That same year Fats and his partner Dave Bartholomew were inducted into the Songwriters Hall of Fame.